One of the more remarkable features of modern society is how much economic inequalities vary across countries and over recent history. For example, the Luxembourg Income Study reveals that the 90th percentile household in Mexico has an income that is about ten times greater than the 10th percentile household. This extreme inequality dwarfs the United States' 90/10 ratio of 5.7 in 2004. Still, inequality in the U.S. dwarfs any other affluent democracy. The United Kingdom had a 90/10 ratio of 4.6 in 1999, and egalitarian countries like Denmark were as low as 2.8 in 2004. Even among seemingly similar former state socialist economies, one cannot help but be struck by the disparities between the Czech Republic with a 90/10 ratio of 2.8 in 1992 and 3.0 in 1996 versus increasingly polarized Russia. Russia's 90/10 ratio was already high at 6.7 in 1992, rose all the way to 9.4 in 1995, before plateauing at 8.4 in 2000. As the political scientist Graeme Robertson remarks, “Russia changed from being Finland into Mexico seemingly overnight.” This variation is not simply due to development or industrialization. For if it was, one would not find countries like Taiwan with a 90/10 ratio of 3.8 in 2000, far below the U.S. and U.K.Social scientists have been interested in this cross-national and historical variation in inequality since at least the nineteenth century. Marx, Weber, Adam Smith and many others devoted attention to why inequality rose with industrialization, and how and/or if anything could be done to address it. Within sociology, one can point to the influential work of scholars like Gerhard Lenski (1984). Yet, it may be only in the last 15 or so years that sociologists and other social scientists have truly begun to produce a field of inquiry on this issue. 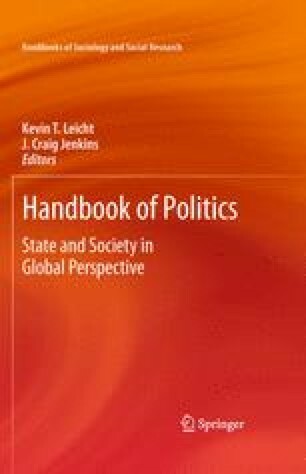 A host of studies have sought to explain differences among affluent democracies, trends in inequality with development, and global inequalities of between and within country trends. Scholars have compared inequality across countries, across cities, provinces and regions, across history, and pooled historical and spatial variations as well. In this fast moving field, we have reached a point where social scientists actually know a fair amount about what is associated with temporal and cross-national variations in inequality. We thank the editors for helpful suggestions. Please direct correspondence to David Brady, Department of Sociology, Box 90088, Duke University, Durham, NC, 27708, (919) 660–5760, email: brady@soc.duke.edu.